Exciting Activities & Events for October. DON’T MISS IT ! As we wrote in our last newsletter, the water has returned after nearly 3 months of absence. Please come out and join in on some of the following activities and bring your friends to introduce them to the Presa Allende. We really don’t want the good times on the water to be SMA’s best kept secret! This month we are gearing up for a full month of events on the water and we hope to see you! Here’s more about some of the feature activities for October. *To sign up to any of the following activities, please see below. Sunset Paddle & Mayan Healing Ceremony – a very significant event that we hope you will join us for. On whatever level you believe in the power of intention, on October 8 beginning @ 6:00 pm, we will together focus our energies and be lead in a Mayan ceremony to heal the troubled waters of the Presa Allende, all of its feeder streams, rivers, arroyos and the Independencia aquifer from which we sustain our bodies. Long Distance Paddle – October 13 @ 11:00 am – is an alternative to going inside a gym/fitness center. Spend about 1.5 hours in a near-continuous paddle on the water in a vigorous workout. Full Moon Paddle – Sunday, October 16 @ 7:00 pm – Anyone who has come on a Full Moon paddle will attest to the fact that is an experience not to be missed. Sometimes it is perfectly clear and the rising moon lights the water enough to read a book. At other times, a sky with textured clouds give us grand views of our moon and reminds us of the magnitude of the cosmos and beauty of planet earth. Early Morning Paddle and Brunch – October 20 @ 9:00 am – Do you like the idea of a relatively easy paddle followed by a delicious brunch and socializing? Join us for this paddle and brunch at a new location – Mercado Sano (the old Don Pedro’s on Ancha). 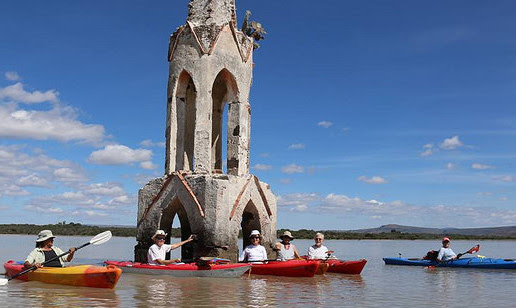 Two-Churches Paddle – October 23 @ 9:30 am – and appropriately on a Sunday – is a four or five hour wonderful time on the water – with frequent land stops – and visits to two of the churches that were flooded in the late 60’s when the Presa Allende was created. Please sign up at least 2 days in advance! Birdwatching Paddle – October 25 @ 7:30 am. – Yes, you must get up with the birds and get on the water if you want the best opportunity to see the many many species of birds that frequent the Presa and Rio Laja. If you have binoculars, be certain to bring them or Audubon will provide them. It is a treat to see the magnificent water foul the reside or pass through our area! Shoreline Cleanup Please join us on October 29 @ 9:30 am for 1.5 hours of walking the shoreline bending over to pick up all manner of flotsam! We have plastic bags and a specially provided dumpster (purchased by an Amigos member). Wear gloves and bring a small pail, if you have one. Talking to the many members who have helped with the Shoreline Cleanups, they will always say how rewarding it is to clean up the shoreline in the company of others. A Whenever Paddle: Do you have a birthday or anniversary coming up? Family or friends visiting? How about a different experience! Schedule a Whenever Paddle. All we need is a minimum of 4 people, 3 day advance notice, payment of 200 pesos per paddler. Go to: Amigosdelapresa.org – Que Pasa – for additional information on the above events. Go to the Amigos webpage and participate in the Silent Auction. All the proceeds from the Auction will go to support Amigos recreational and environmental programs. Many thanks to all the artists and donors who contributed works for the auction. You’ll find some fantastic deals on many very beautiful pieces. Go to: www.amigosdelapresa.org and click on the ‘Silent Auction’ banner/button. This will take you to all the items, pictures, and full descriptions! AND, thank you in advance for your support! Want to be on the mailing list for Amigos News and Events ?